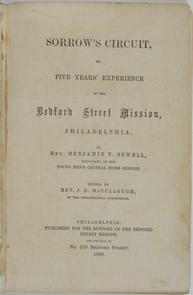 Title page of "Sorrow's Circuit or Five Years' Experience in the Bedford Street Mission, Philadelphia." Written by Rev. Benjamin T. Sewell, Missionary of thee Young Men's Central Home Mission. Published in Philadelphia, 1860.